The idea was so simple, and yet it took toymakers until 1976 to come up with a line that mixed the build-em-up concept of Lego, the characterization of action figures and the ability to lose teeny-tiny pieces around the house of, well, any small toy you've ever lost as a kid. 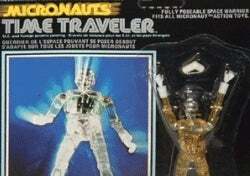 I'm talking, of course, about Acroyear, Pharoid ("with time chamber") and Time Traveler: The Micronauts. Mego's line of miniature, interchangeable science fiction heroes came about more as a cheap way to grab market share as any plan to revolutionize the misfit island of toys - Looking for a way to break out of the "licensed" toy business, Mego (makers of figures based on Sonny and Cher, Farrah Fawcett, Diana Ross and far too many others) decided to go into the original toy business... by licensing the Japanese line of "Microman" toys, changing the names and paint jobs, and releasing them to an American audience hungry for toys based around a loosely-sketched science fiction theme that apparently involved some kind of time travel, some robots, and something called a "space glider". Apparently, kids really were waiting for something like that, because the line was successful enough for "The Interchangeable World of The Micronauts" to continue for five years, finally running out of steam when Mego themselves went under in the early '80s. Not that that was the end of the concept - Marvel Comics' tie-in series continued until 1986 (going out in a conceptual blaze of glory that definitely confused this then-twelve-year-old; they had to kill themselves why, exactly? ), and the toys and comic have both been the subject of a number of revivals throughout the years. You have to wonder what the draw of the toys was: That they're small, and easy to stick in your pocket? That you could pull them apart and then put them together in a variety of different ways? Or is it simply that children in the 1970s were so hopped up on the SF goofballs of Star Wars that they'd go gaga for anything with a hint of space?